All About Reading Level 2 GIVEAWAY! 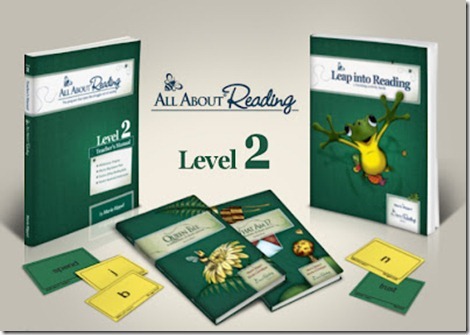 I’m so excited to announce that the All About Reading Level 2 is finally available! And to celebrate it’s release the awesome people over at All About Learning Press are offering a FREE COPY of All About Reading Level 2 for one of you! It’s no secret I H. E. A. R. T. All About Learning Press! I started using them last year for our phonics and spelling help and we’ve never looked back. We have had great results since starting with their programs. I absolutely love how they script the lessons, as well as the constant review. I think it’s the only program that has had success in getting my kids to actually remember phonics rules! They teach reading concepts in a logical order, and review constantly so that you aren’t forgetting things as you go. I also like that the program is hands-on as well. We use their magnetic letter tiles, as well as our iPad chalk board, stamps, and other ways to help make it more fun as well. I am also loving the phonogram cards (yellow ones) that come with the program. 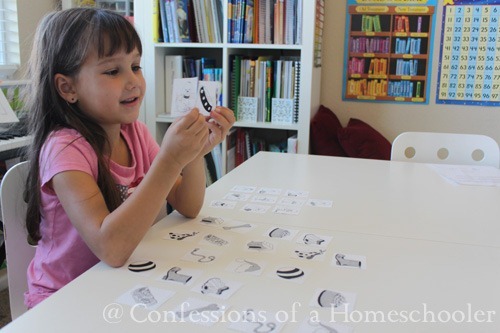 They make it really easy for me to review all of the phonic blends and letter sounds each day. My absolute favorite ones though are the blue key cards. My kids actually think they’re playing a gam each time we review all of the rules! 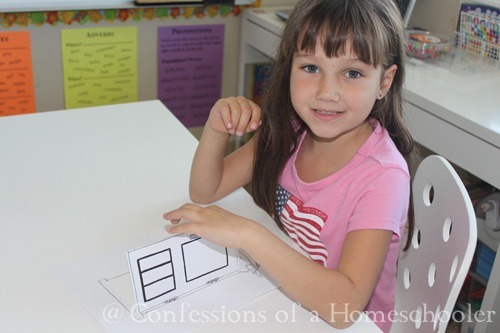 Some of our favorite things are the fun games and activities that go with the lessons. They are simple, but Tinker Bell absolutely loves them! Here she is playing the puppy match up game. She picks a puppy, and then picks its coordinating accessories such as a dog bowl, collar, toy etc. If she can read all of the rhyming words on the backs of the pictures, she gets to keep the puppy and its toy! When she was done with the activity she colored the puppies, and then played with them. Like I said, simple but fun and effective, and definitely motivating too! Since the games are so cute and engaging, she loves to play them so there is no whining about doing her work! 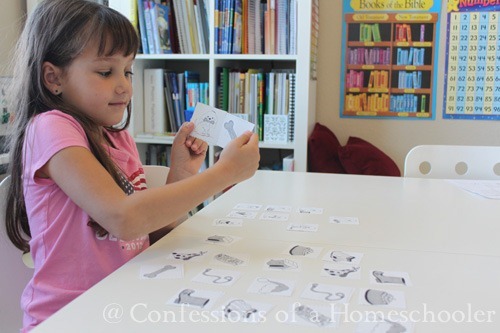 Here we are practicing open and closed syllables, she loved the little door and I think it will really help her remember open and closed syllables! What is the difference between All About Reading vs All About Spelling? All About Learning Press recommends completing All About Reading Level 1 first, and then adding in the All About Spelling program. This way students get a solid start in reading first, and have a strong basis for spelling as well. AAS and AAR both use the same sequence and the same phonograms. Both are complete phonics programs, so they are interrelated in that way. AAS teaches words from the spelling angle, and AAR teaches words from the reading angle. And YES they are different! You may find that you have a student who is a great reader, however struggles with spelling. All About Reading includes decoding skills, fluency, comprehension, vocabulary and lots and lots of reading practice. It will use letter tiles just like AAS does. AAS focuses instead on encoding skills, spelling rules and other strategies that help children become good spellers. For this reason, the programs are also independent of each other so students can move as quickly or as slowly as they need to with each skill. Kids generally move ahead more quickly in reading, and you don’t want to hold them back with the spelling. I will have a full review of this program coming up shortly, but I wanted to give you all a sneak peak now so you can get your discount! You absolutely NEED the teacher’s manual and student activity pack at the very least. I’d also highly recommend the readers as they go with the lessons, and students practice stories with the words that they are currently working on in the student activity packet. Why do I love All About Learning Press so much? It’s easy to do with NO prep work on my part. The phonics rules are reviewed often so kiddos remember them. It’s a hands-on learning style that makes learning fun. Results: I personally witnessed in overnight improvement in all of my children’s spelling and reading skills. The kiddos love it. ‘Nuff said. Want more information? I wrote a review of it awhile back you can read my original All About Spelling Review here. Want to win a FREE copy of All About Reading Level 2 for your family? this would be so cool! I just spoke with them the other day because I really like their program and want to use it for my kiddos! This would be great for my girls! Awesome. Oh, how I would love to have this for my boys! We need something to help reinforce and learn phonics rules! I would love to have this to help teach my son. Thanks! We use All About Spelling and would love to use this to help reinforce reading phonics! Thanks! This would be awesome to win. As a new homeschooler we are always on the lookout for what works best! Thanks! We have enjoyed Level 1 and would love to win Level 2.